Republican Vice-Presidential nominee Mike Pence says it’s time to restore security and integrity to America. 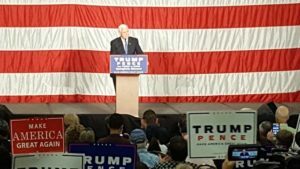 Speaking at the Springfield Expo Center Tuesday, Pence told a standing room only crowd of at least 1,000 people the grass roots effort is catching on. “Today, (we’re) ahead by nine in the latest poll here in Missouri. And even CNN reported today that Donald Trump is in the lead,” says Pence. The national CNN poll shows Trump leading Democrat Hillary Clinton — 45% to 43%. Pence says it seems like the world has been spinning out of control since Hillary Clinton became Secretary of State. He says it’s only making the U.S. and the world weaker. “Donald Trump and I believe that the weak foreign policy of Barack Obama and Hillary Clinton — leading from behind; moving red lines; feigning resets with Russia; the rise, rule and reign of ISIS — are a testament to this truth of history,” says Pence. Pence says the only way to make what he calls Hillary Clinton’s scandals go away is to make Trump the next president. Pence says if Trump is elected president, he’ll repeal Obamacare, back law enforcement, build a wall along the border, and change the status quo in Washington. Before Pence took the stage, Republicans used the rally to stir up support for other candidates in November. Eric Greitens used his time to garner support to be the next governor. He says his opponent, Democrat Chris Koster, would just rubber stamp Hillary Clinton’s policies. Republicans — including Mike Pence — reminded voters to send Missouri U.S. Senator Roy Blunt back to Washington. Pence says Blunt has done a lot of good for Missouri, but couldn’t be at the rally because he was busy working in Washington. A statement from Missouri Democratic Party Chairman Roy Temple blasts Trump and Pence. Pence also held an event today in the St. Louis suburb of Chesterfield.